Luton boss Mick Harford revealed that a number of Premier League clubs are watching his high-flying side as they look to secure a second successive promotion this season. The Hatters chief has some outstanding talent in his squad, with full backs Jack Stacey and James Justin in particular in wonderful form this term. When the summer comes and wherever we are we’ll have to assess it and see where we are. Players such as James Collins, Andrew Shinnie, Sonny Bradley and Matty Pearson to name just four have excelled too, as Harford said: “We’ve got some good players here and I’m sure that people will be looking. Although a number will be on the wanted list, Harford has declared the club will be hoping to keep their best players at Kenilworth Road next term. He continued: “Of course we would, but we just don’t know. Football’s a strange game, you don’t know what’s around the corner, it throws all kinds of conundrums up on a daily basis. “That’s our ambition, but I only think of the next game and I know it’s an old cliche, but that’s as far as I look, honestly. If bids are received for players, then Harford will still have role to play in whether they remain or not, as he continued: “I’m part of the process but at the end of the day, the final decision comes down to the manager and the board. 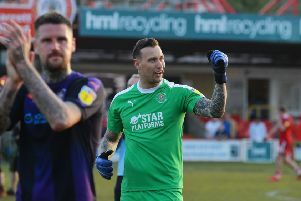 Should Town decide the price is right for any of their stars, plans are in place for such a day, as Harford added: “Of course we have targets and players. We look forward, we have forward planning meetings, in terms of where we could be, where we might be.